As a follow-up to my earlier entry about whether copywriting should be clever, this post takes a closer look at what makes a clever ad, what makes a dull one, and what makes a largely incomprehensible one. 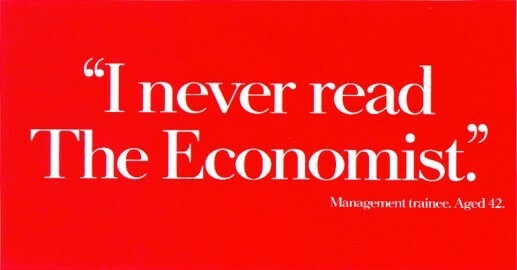 The best print ads are normally those where the headline and the picture work in harmony, together communicating the intended message in a memorable way, and where neither element would really do the job in isolation. Usually these consist of a straight headline and a bent visual, or a bent headline and a straight visual, where ‘straight’ means straight-forward, and ‘bent’ means striking or unusual. Many famous campaigns feature straight lines and bent visuals. The ‘Probably the best lager in the world’ campaign for Carlsberg, for instance, or ‘If only everything was as reliable as a Volkswagen’. Great lines, but neither would get very far without the striking visuals that accompany them. What of course you don’t want is a straight line with a straight visual, which is likely to lead to a very straight ad – i.e. uninteresting. And a bent line with a bent visual commonly signifies that the creators are trying too hard to be clever – and failing to communicate effectively. So it’s generally worth keeping your headlines bent – unless your visual is too. This entry was posted in Advertising copywriting and tagged creative advertising. Bookmark the permalink. What do copywriters major in?